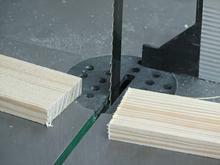 How do I measure my bandsaw for you to make my blades for me? Then you add your axle dimension to your wheel dimension 72+40.82=112.82? So your blade length would be 112.82? or 9? 4 13/16?